This year marks the centenary of the establishment of Australia's capital city, Canberra. A number of exhibitions around Canberra explore this important milestone, including Glorious Days: Australia 1913 (National Museum of Australia), The Dream of a Century: The Griffins in Australia's Capital (National Library of Australia) and Design 29: Creating a Capital (National Archives of Australia). The one, however, which looks in detail at the moment that Canberra was born is 'But Once in a History': Canberra's Foundation Stones and Naming Ceremonies, at Parliament House. This exhibition provides a detailed retelling of Canberra's foundation on 12 March 1913. 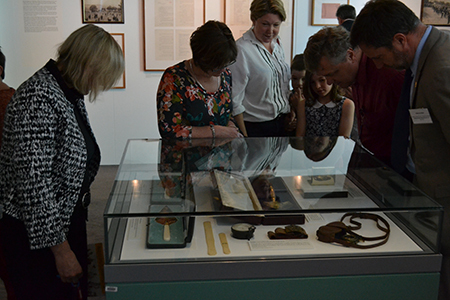 This exhibition was curated by David Headon, the history and heritage advisor to the Centenary of Canberra. Headon, a passionate believer in Canberra, makes the argument that the foundation of Australia's capital does not receive the attention it deserves. Taking aim at the shibboleth that Canberra represents little more than a compromise between the national ambitions of Sydney and Melbourne, Headon argues that the founding of Canberra was a moment when Australia imagined a better future. It represented the hope and optimism embedded in the larger project of federation. The title of the exhibition is a quote from the introduction of King O'Malley's book, Canberra: Capital City of the Commonwealth of Australia. O'Malley, the Minister for Home Affairs in 1913, and one of Canberra’s main progenitors, declared that: 'Such an opportunity as this, the Commonwealth selecting a site for its national city in almost virgin country, comes to few nations, and comes but once in a history'. When viewed through O’Malley’s eye, the ceremony held on 12 March 1913 assumes much greater significance. Rather than one of many worthy public events held in the capital, it becomes a turning point in Australian history. 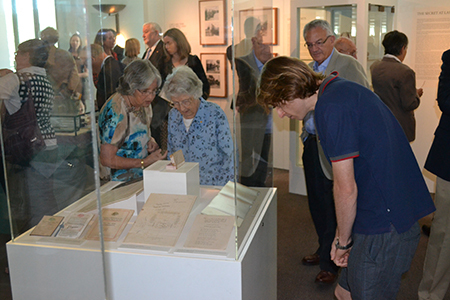 To bring the naming ceremony to life for the visitor, Headon makes use of a variety of documents, ephemera, photographs, cartoons and objects associated with the founding of Canberra. My personal favourites were the selection of objects relating to the governor-general in 1913, Lord Denman, and his wife, who both officiated at the naming ceremony. Lady Denman, famous for her role in announcing that the new capital would be called 'Canberra', with the emphasis on the first syllable, is represented in the exhibition by a beautiful cream silk parasol, which she carried on the day. A magnificent plumed hat worn by Lord Denman, speaks to Australia’s place in the British Empire. Other objects featured in the exhibition include two cycloramic lithographs by Charles Coulter. These cycloramas, which provide a 360-degree view of the proposed site of the city, were included in package of information provided to entrants in the 1911–12 international competition for the design of the federal capital. 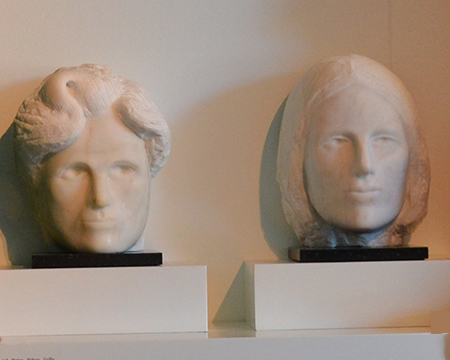 The winners of the competition, Walter Burley Griffin and Marion Mahony Griffin, are represented by two busts from the Parliament House collection. In the exhibition text Headon goes into extended detail to explain how the Griffin plan, while winning the competition, was initially rejected by the departmental board responsible for the construction of the city. It was not until the end of 1913, and the election of a new Australian government, that Griffin was appointed Director of Design and Construction for the city. 'But Once in a History' is a wonderful exhibition for those interested in the history of Canberra and the development of the national capital. Headon has made good use of collections held by the National Library, National Archives and the Australian Parliament to provide a glimpse into the events of 12 March 1913. The exhibition text, while perhaps considerably longer than most visitors are prepared to read, is rich in detail of the personalities and rivalries surrounding the foundation of the city. After leaving the exhibition, I came away with a new perspective on the city’s modest foundation stone. This monument, which sits quietly on the slope between the new and old parliament buildings, is a reminder of a day when nation’s leaders gathered to celebrate the creation of a new capital. While the vision for a new capital was soon curtailed by the outbreak of war, the foundation stone still stands as evidence of the great optimism and hope that surrounded the birth of Canberra in 1913. Guy Hansen is head curator of the Australian Society and History program at the National Museum of Australia.